Until LAWYERCOIN WALLET is launched, here is the methods to BUY LAWYERCOIN (LAW). 1. BUY LAWYERCOIN WITH BTC DIRECT! After the block confirmation, you will receive in max. 72 hours the amount of LAWYERCOIN ! You will receive LAWYERCOIN IN the same account that you send BTC !The amount of LAWYERCOIN will be sent to you in the automatic mode! 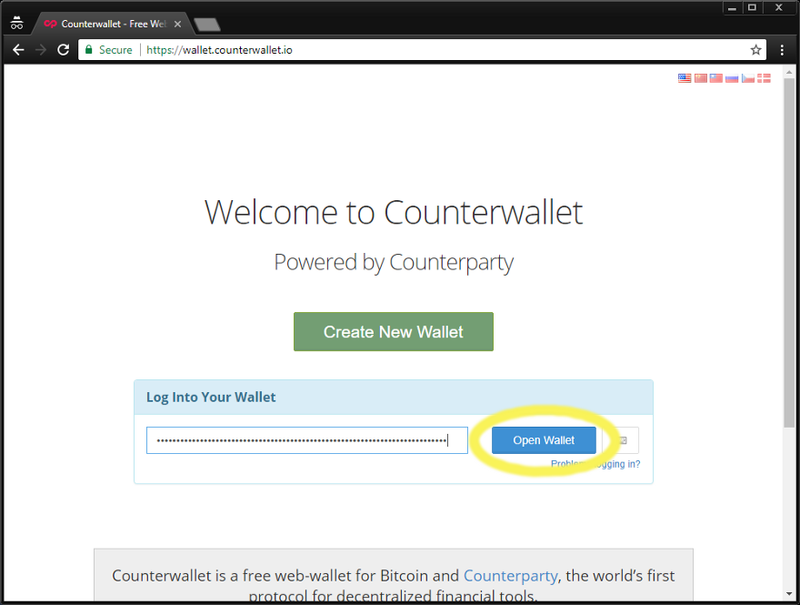 ATTENTION : you must open an account on the counterwallet.io .This method work only with an open adress on counterwallet! You will receive LAWYERCOIN only after we have the confirmation to the block and only after we have the amount BTC in the account! 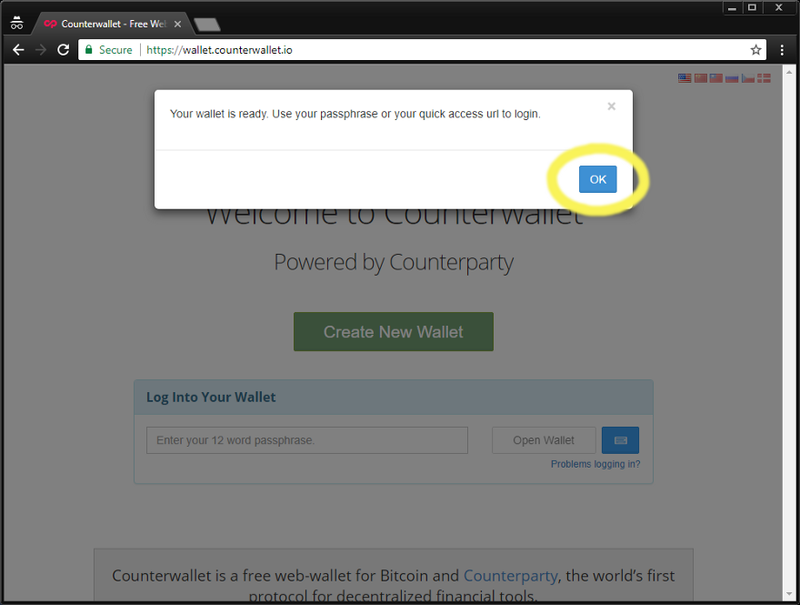 Visit https://counterwallet.io/ in a modern browser. If the service is up, you will see a green “System currently appears UP” notice. For purposes of this demo, we will be creating a new wallet using the Counterparty testnet, but the process is identical for the production network. 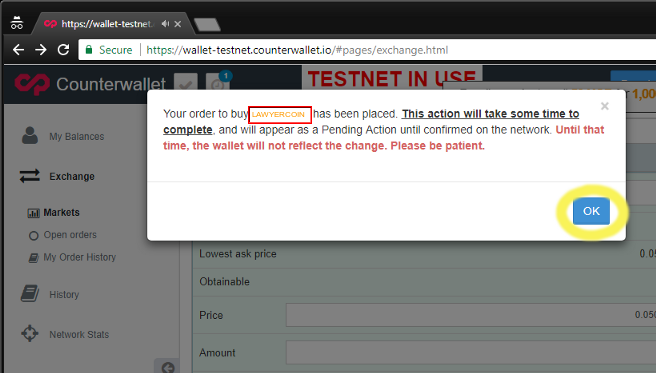 If you already have a Counterwallet.io wallet, you may skip to Step 11. 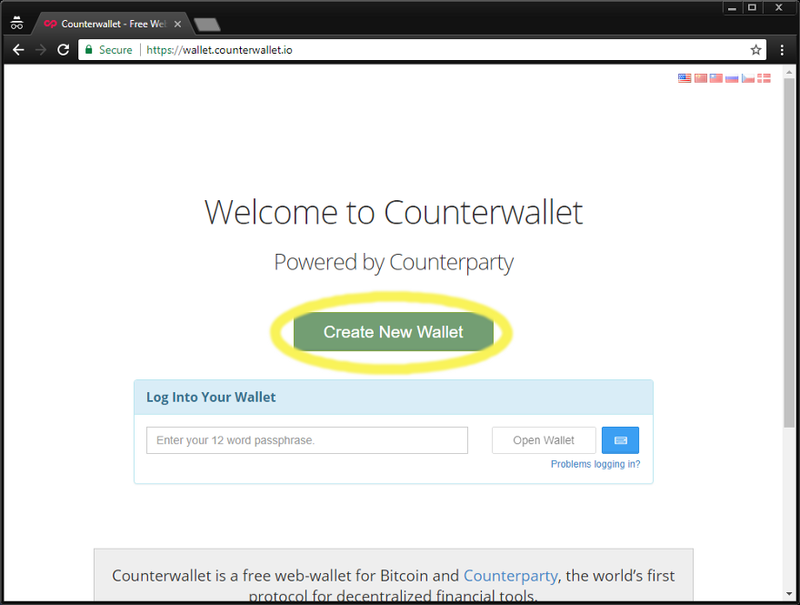 Otherwise, click the “Counterparty: Official Counterparty Counterwallet Server” button. Write down the generated passphrase. It will only be shown once, and if you lose this key, you will permanently lose access to the contents of your wallet. 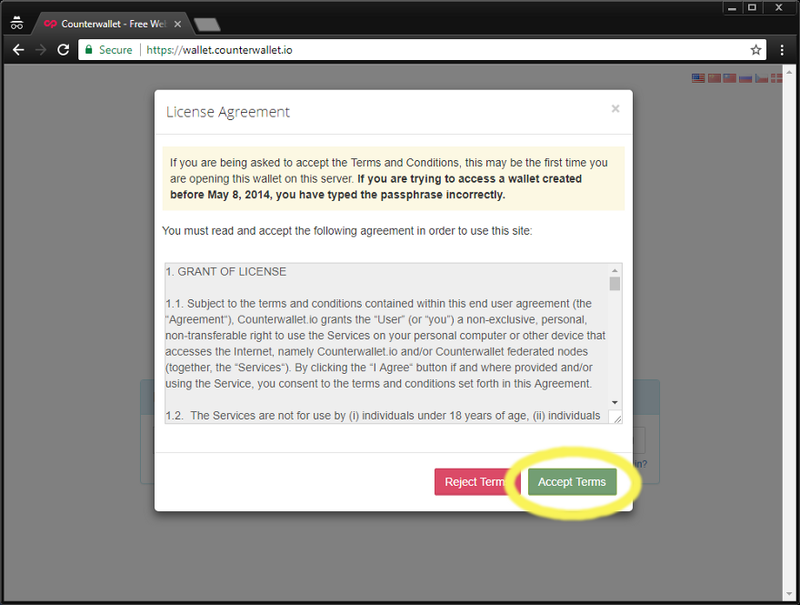 Optional: Generate a Quick URL. This URL is not password protected. Anyone who has this URL will be able to spend everything in the wallet. Do not save this URL to your browser favorites, but store it in a secure location. You can safely skip this step if you have properly saved your passphrase. After logging in, you will see the first generated wallet address and existing zero balances for BTC and XCP, but in this example the wallet already has a balance on each. 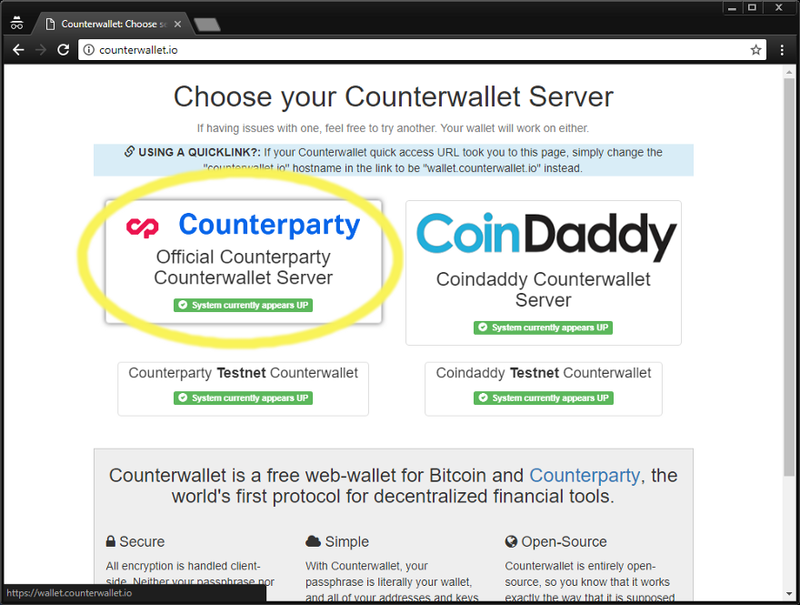 Note that Bitcoin as a trading currency is not currently well supported at counterwallet.io, and all trades should be made with XCP unless you know what you are doing with the counterparty protocol and can manually create the necessary raw signed counterparty transaction. Liquidity using BTC is practically non-existent. Our recommendation is that you use only XCP for trading on the Counterparty DEX. XCP can be purchased at various centralized exchanges, and while we do not endorse any centralized exchanges, Bittrex appears to be a reliable and liquid market for XCP as of the time of publication of this document. 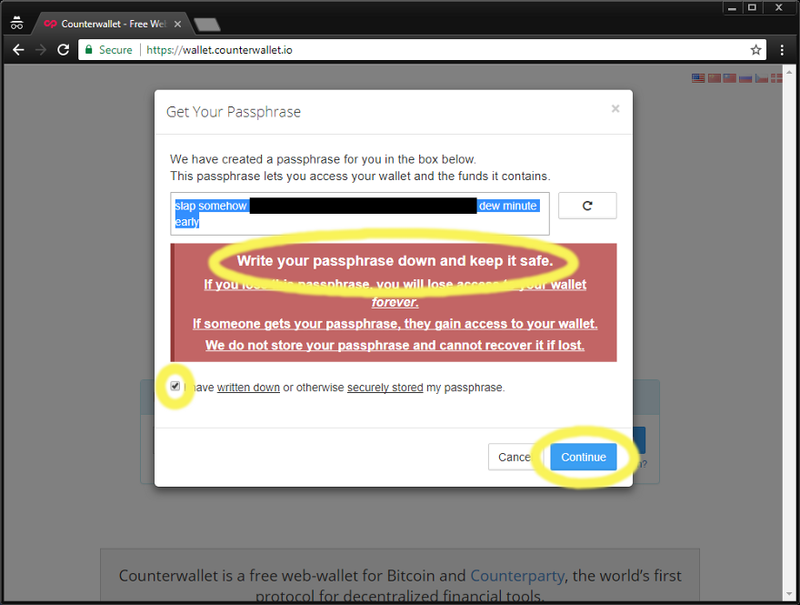 Purchasing and transferring XCP from an exchange is beyond the scope of these instructions, but you should use the address created in the counterwallet.io wallet as your withdrawal address for both BTC and XCP. Find “LAWYERCOIN/XCP” “LAWYERCOIN/BTC” “LAWYERCOIN/FLDC” in the list of “top pairs” (the order of this list can change); or, in the “select another pair” section, type “LAWYERCOIN” and click “XCP” “BTC” “FLDC”to see the market. Scroll down to see the current market bids and asks, and to see a history of the most recent trades. 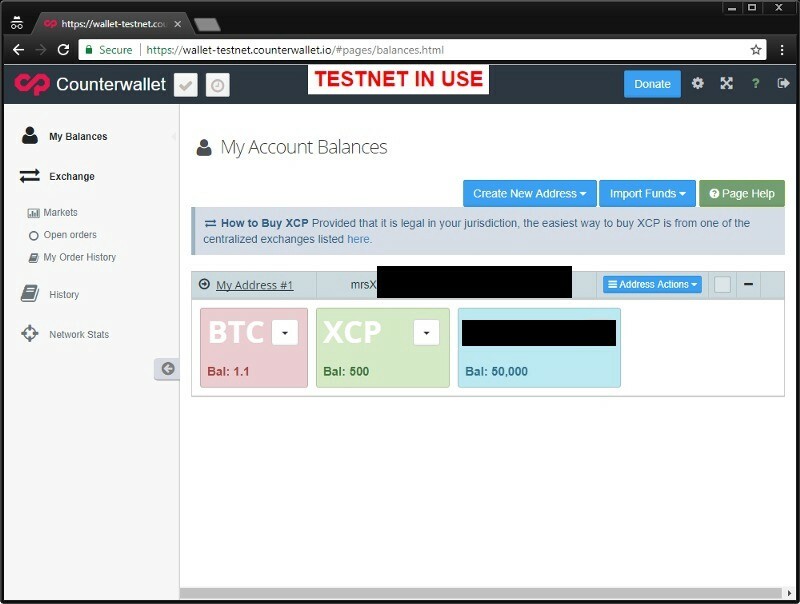 Note: to place a token purchase order, you need XCP and a small amount of BTC in the counterwallet.io address you created. 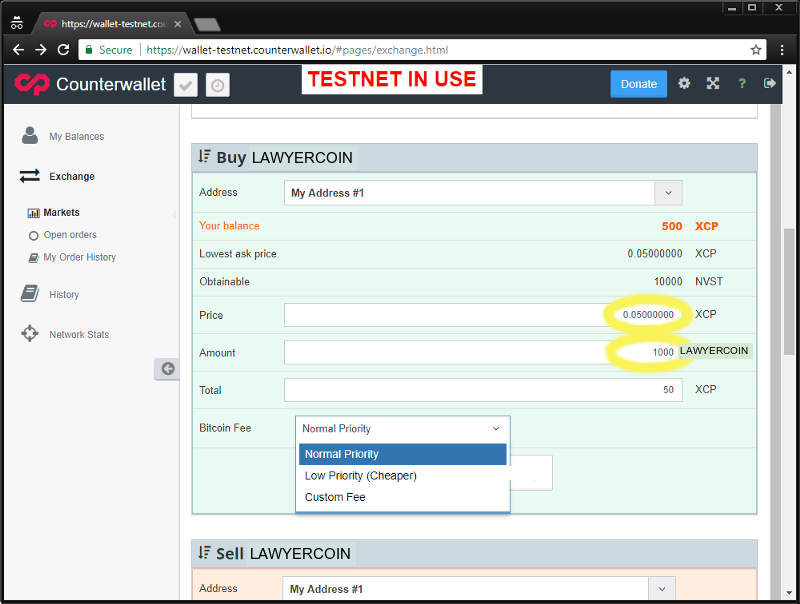 To make a sell order for tokens you own, you need LAWYERCOIN tokens and some BTC in the counterwallet.io address you created, but you do not need XCP. All counterparty transactions on the counterwallet.io DEX are bitcoin transactions, and therefore all require enough bitcoin to pay the bitcoin transaction fees at the current market fee level. Be aware that paying too low a bitcoin fee may cause your order to be delayed for up to several days, and the market price may change, preventing your order from executing before it expires. The default expiration for orders on the Counterwallet exchange interface is 1,000 bitcoin blocks, which is appoximately 1,667 hours, or 6.9 days. 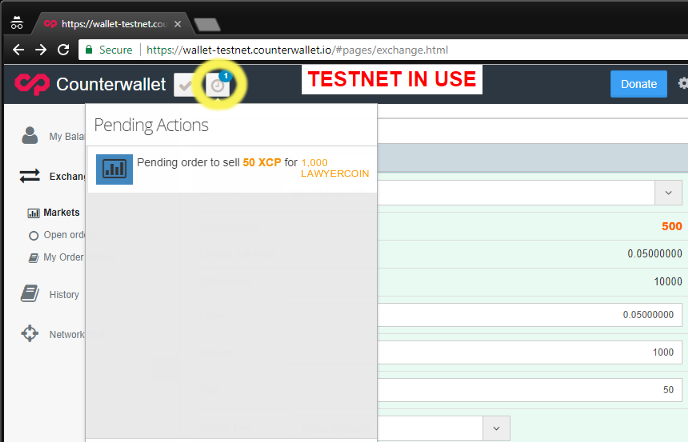 In this testnet example, we demonstrate purchasing LAWYERCOIN with XCP. A sufficient amount of bitcoin is need to cover several transaction fees at the address we will be trading with. 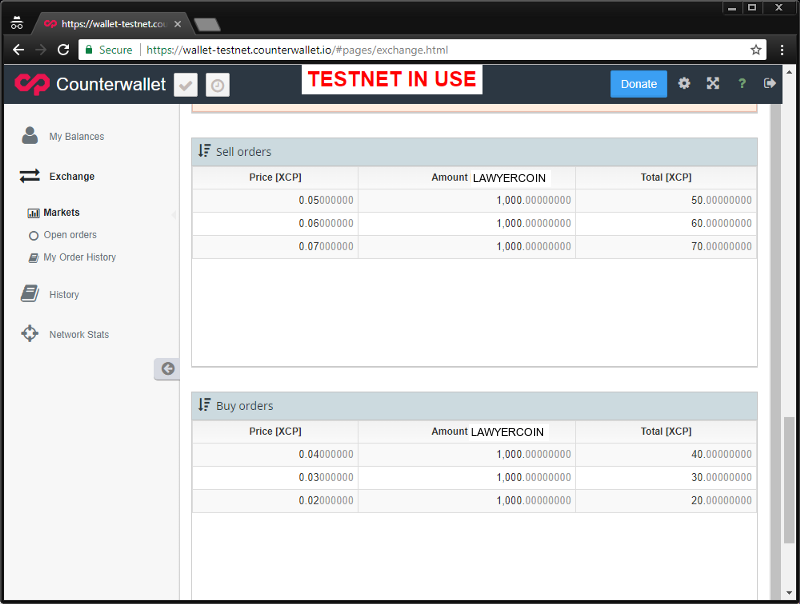 On the Exchange page when the LAWYERCOIN/XCP/BTC/FLDC pair is selected, find the “Buy” section. 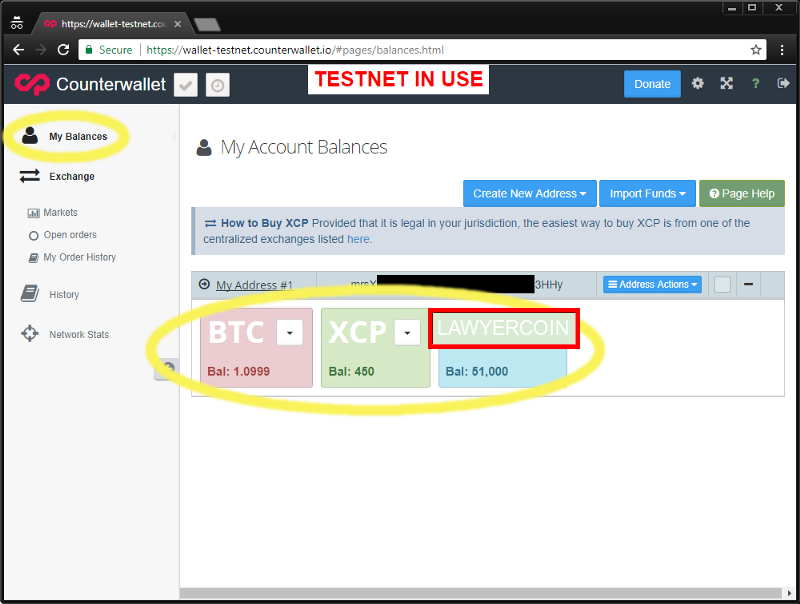 Your balances of XCP/BTC/FLDC will be shown for your convenience. 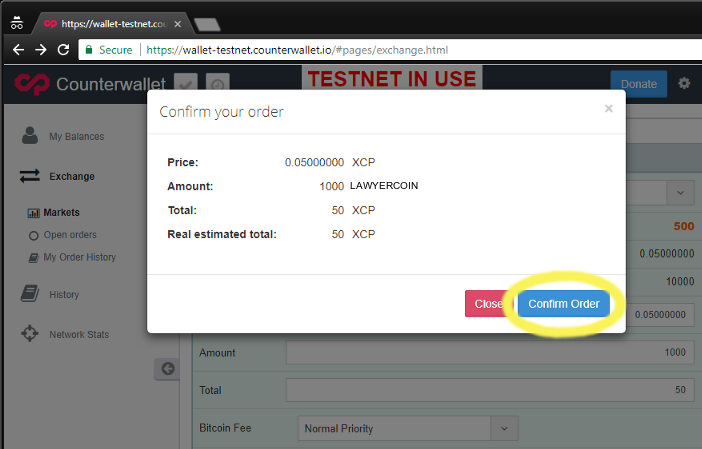 The example demonstrates what the interface looks like when placing an order to purchase LAWYERCOIN for XCP , and calculates the total for us. Note the “Bitcoin fee” drop down. You may choose the priority at which you wish to place your order; the “normal” bitcoin transaction fee will cost more but will confirm faster. A low priority fee can take considerably longer, and if you set a custom fee too low, it may even take days to enter the order book. Unconfirmed orders are visible to other traders, who can then enter a competing order at a better price and pay a higher fee, effectively stepping in front of your order, so be judicious about the fees you are willing to pay. “Normal priority” is appropriate in most instances. When you have completed the “Buy LAWYERCOIN” order form, click the “Buy LAWYERCOIN” button. The order confirmation screen will appear. Note that the fees are not visible using the counterwallet.io exchange — you will be advised if your bitcoin balance is insufficient to cover the calculated fee. Click the Close button to cancel the order, or Confirm to place the order. Note the Pending Transaction notification, and click the icon to see the pending order waiting to be confirmed on the bitcoin blockchain. Once the transaction has been included in a bitcoin block, the order will be considered active. A chime will play if your sound is enabled, and a notification will briefly appear at the upper right. Also note the Notification checkbox at the top of the screen. Click it to see your active order notifications. Click the My Balances menu item to see the new balances. 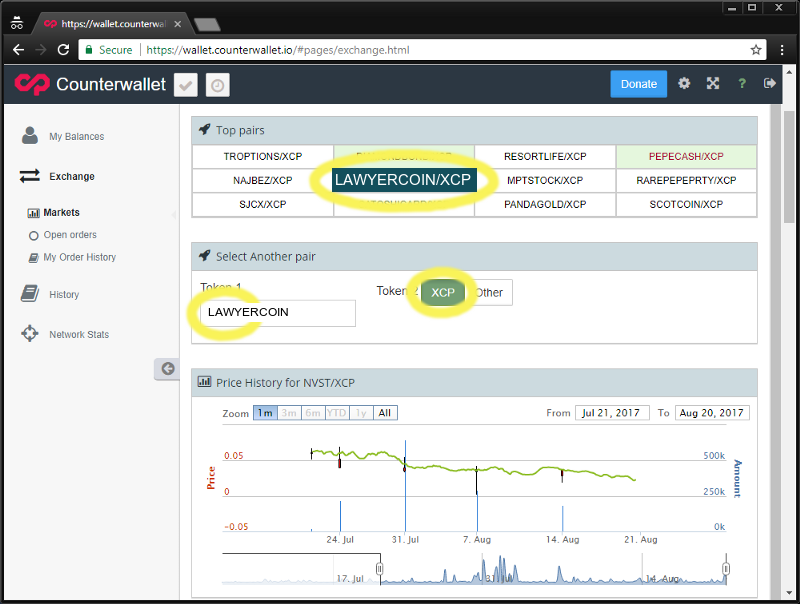 For this example trade, XCP has decreased and LAWYERCOIN has increased as a result of the matched order. A bitcoin fee has also been deducted from the available BTC.